This powerful presentation by photographer and explorer David Thoreson exposes the truth about climate change affecting YOU and everything on Planet Earth! His fearless exploration of the world’s oceans and polar regions have brought him face-to-face with the most important issue of our time – Climate Change. Not confined to the Arctic, weather weirding is spreading across the USA!Experience David’s breathtaking adventures through this stunning multi-media event using photography, humor, and storytelling of his often-harrowing experiences in the most remote regions of the planet gleaned from his 65,000 miles of sailing including the Arctic’s Northwest Passage. David Thoreson is a professional photographer, sailor and explorer who has logged over 65,000 ocean miles. David shares stories of adventure as the first American to sail the Arctic’s Northwest Passage in both directions. 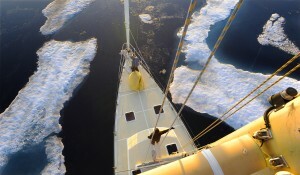 He has sailed over the Arctic Circle six times and below the Antarctic Circle. Thoreson provides an eye-witness account of how climate change impacts sensitive polar and ocean environments. David’s work has appeared across a broad spectrum of media from the Smithsonian to the Guardian, PBS and TED. In 2010, David completed a 28,000-mile circumnavigation of the N/S American continents on the 64-foot research sailboat Ocean Watch working with NASA, NOAA and universities in two hemispheres. Awesome and inspiring are the words I would use to describe hearing David Thoreson share his journeys transiting the Arctic and Antarctic waterways to a large group of students, faculty and community members at FDU. The mesmerizing stories of how he sailed through some of the most treacherous reaches of the planet, supplemented by a collection of the most amazing photographs, were wondrous in themselves. When David responded to questions about what we can do, his answers about courage and commitment moved and inspired all. Mr. Thoreson doesn’t befuddle his listeners with meaningless numbers or quotes from the government- he speaks from his experience of his adventures, and he speaks from the heart. When I attended David’s lecture at Monmouth University, I was incredibly moved by the insight that he provided to the students and faculty. He showed us his firsthand experiences of sailing around the world, especially the Arctic. His eye-opening photographs prove there is something incredibly wrong in the most remote places in the world. Thoreson concluded on an optimistic note, confident that scientists, students and civilians working together could address problems presented by climate change. © 2017 Contemporary Issues Agency All right reserved.